Shveta’s Recipes App on Android too! 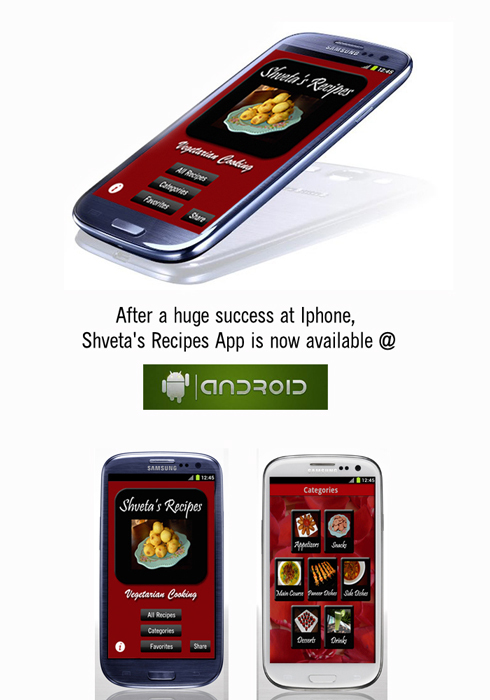 I am glad to announce the launch of Shveta’s Recipes App on Android. Now available at Google play. Shveta’s Recipes has 200 vegetarian recipes for easy cooking. All recipes have precise ingredient list and a detailed step-by-step method. Each recipe has a well presented picture of the finished dish. These recipes are categorized in 7 different courses; Appetizer, Main course, Paneer dishes, Snacks, Side dish, Drinks and Desserts. The recipes are mostly influenced by the regional food of different states in India. Few recipes are continental. Suggestions, ratings, comments and feedback is highly appreciated.